The information in this document is current as of Spring 2019. Registration for Spring leagues starts in January (subject to change). 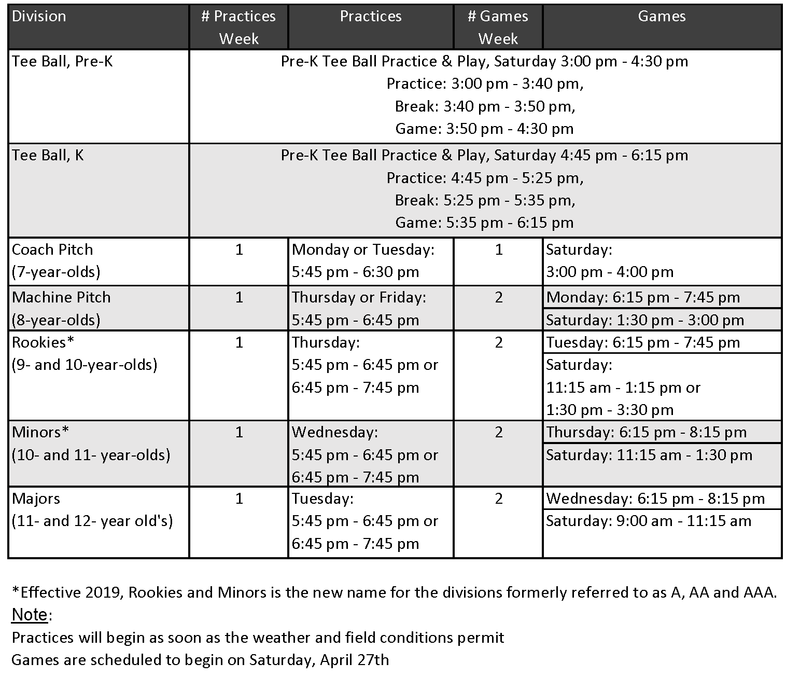 The Pittsford Little League Spring regular season runs from late April to near the end of June (end of school year). We offer baseball and softball to all players from Pre-K through 18 years of age. Teams will generally play 10-15 games during the season, with 1 or 2 practices per week, depending on the level and size of each league. See our baseball, softball or challenger leagues. Tee Ball and Instructional Baseball leagues (Pre-K through 2nd/3rd Grade) are grade-based. Qualifications for non-instructional leagues (ages 9+) are based on age and skill. Evaluations determine placement. Baseball is open to boys and girls. Softball is girls only. Girls tend to choose softball as they get older, but are welcome to play baseball as long as they want. Tee Ball and lower-level Instructional Baseball leagues may have all-girl teams if there is enough interest. Please register early! REGISTRATION IS FIRST COME, FIRST SERVED, AND TEAMS MAY FILL UP! Fees increase by $35 after March 14. Registrations submitted after the late date will be accepted until the deadline, but may be subject to a wait-list. The final registration deadline for each league is subject to change without notice. Please check each league for more details. There is a $40 fee reduction for the third and each subsequent player registered in each family. New Pittsford residents are exempted from a late charge. Spring refunds must be requested by March 1 for baseball and softball leagues through 12 years old, and April 6 for baseball Juniors and Seniors, and Softball Seniors. If you have questions about Pittsford Little League, please contact the Pittsford Little League President at .